The NCBS campus is equipped with a state of the art medical centre as well as a medical room at the off-site housing centre. Both of these facilities function as primary health centres. Doctors as well as a physiotherapist staff the centre. The medical centre offers outpatient consultation services as well as prophylactic services such as vaccinations. 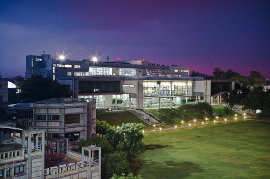 When required specialist consultations and inpatient services are catered for by designated tertiary care hospitals in the vicinity of the NCBS campus. There is an on-site ambulance 24*7 that is able to transport those needing inpatient care to nearby hospitals. A free and confidential counselling service is available for all campus members. It is provided by an independent support group- Parivarthan. An on-site crèche caters to the childcare needs of on campus colleagues. The crèche ‘Dolna’ operates from the main campus and offers childcare during working hours to children of staff and students who work on campus. Children engage in activities include nature walks around campus and well-planned activities that promote learning. They also benefit from science­ related activities such as bird watching or campus walks with students and faculty of NCBS and other advantages that typically come with being part of a growing campus. Our campus is firmly committed to ensure the safety and well-being of our entire community, including students, faculty, staff, and visitors. We do not tolerate any actions leading to a hostile atmosphere in the workplace. Any safety or security incidents should be immediately reported to the emergency numbers.